Barling is a village and former civil parish, now in the civil parish of Barling Magna in Essex, England. It is located approximately 6 km (3.7 mi) northeast of Southend-on-Sea and is 29 km (18 mi) southeast from the county town of Chelmsford. 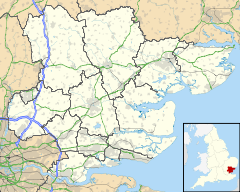 The village is in the district of Rochford and in the parliamentary constituency of Rochford & Southend East. There is a Parish Council of Barling Magna. In 1961 the civil parish had a population of 1075. The parish of Barling Magna also includes the hamlets of Little Wakering and Stonebridge, and had a population of 1,657 according to the 2001 census, increasing to 1,740 at the 2011 census. The word "Barling" is said to derive from two Saxon words "ban", a boar, and "ing", a meadow. Barling is by Barlinghall Creek, a tributary of the River Roach. In its agricultural setting, Barling village is mainly situated along Little Wakering Road, Church Road and Barling Road. Where these roads meet is the village duck pond. In the adjoining village of Little Wakering stands a terrace of 17th century dormer cottages. Opposite is the church, dating from the 11th century, but largely rebuilt by John De Wakering, Bishop of Norwich. In the tower are displayed the Royal Arms of George III. Barling Magna Parish Council holds monthly public meetings. The nine parish councillors' responsibilities include the newly-refurbished Parish Hall at the junction of Little Wakering Road and Church Road, the Barling Magna Wildlife Reserve and local amenities, for example street-lighting. The Parish Council website carries local information as well as details of forthcoming council meetings. Barling is part of the electoral ward called Barling and Sutton. The population of this ward at the 2011 census was 1,876. Wikimedia Commons has media related to Barling. ^ "Barling Magna CP through time". Vision of Britain. Retrieved 4 January 2018. ^ "Parish Councils List Of Parish Clerks". Retrieved 24 July 2017. ^ "Population Statistics Barling Magna CP through time". Vision of Britain. Retrieved 3 January 2018. ^ "Parish population 2011". Retrieved 23 September 2015. ^ "Barling Magna Parish Council". Retrieved 24 July 2017. ^ "Barling and Sutton ward population 2011". Retrieved 23 September 2015. This page was last edited on 20 August 2018, at 10:36 (UTC).